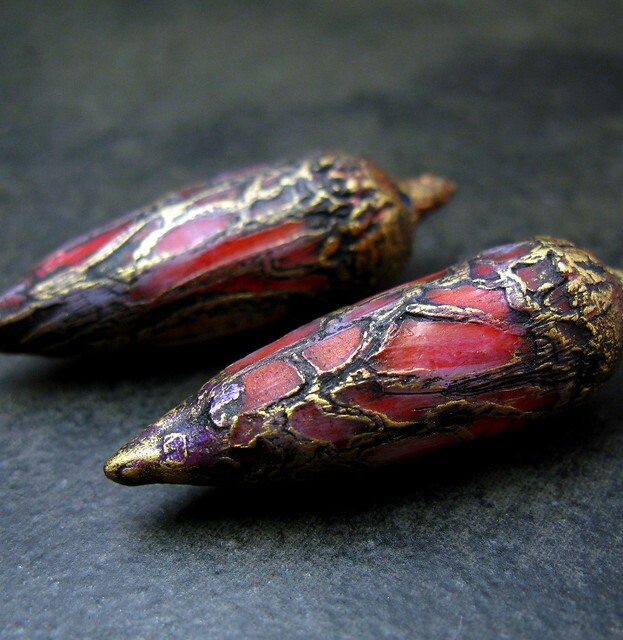 Today, two of my favorite blogs, Paisley Lizard and Earrings Everyday, posted about their polymer clay pods. Seeing the wonderful shapes, textures, and colors of these pods got me to thinking about how often the pod shape is used in polymer and how it can be a perfect little project for an artist to express or develop their vision. 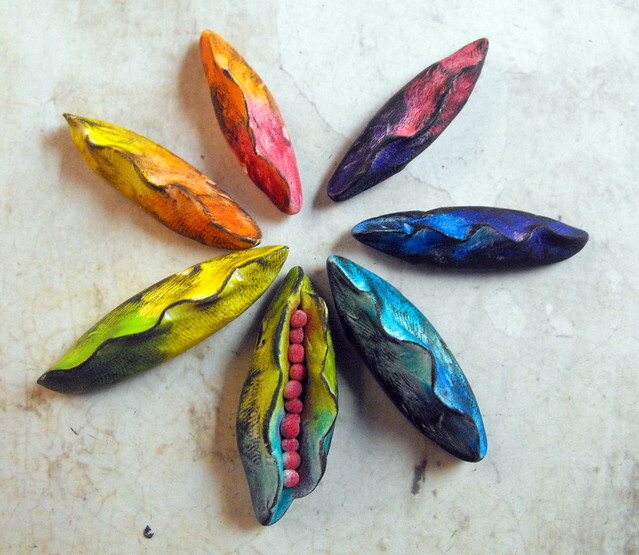 You can make a polymer clay pod in any color, with any mood, and in a variety of original organic shapes. 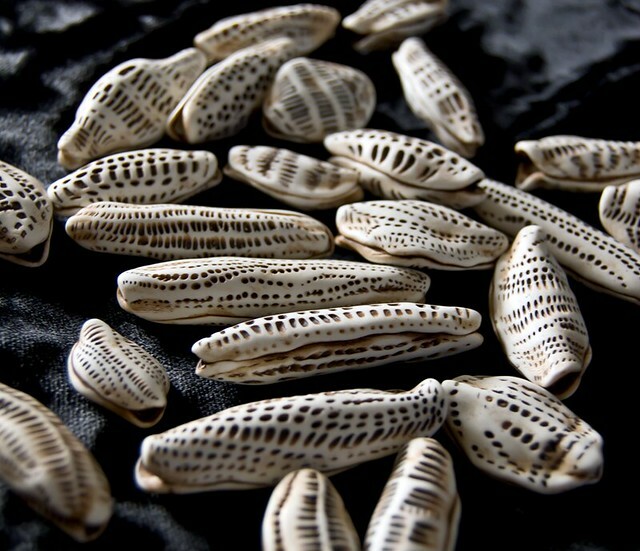 The pods themselves can be used as beads in a necklace, as earring dangles, as a headpin, or even just as something that you collect in a bowl and enjoy holding in your hand. Some artists are interested in the shape of the pod itself, others are merely using the pod shape to carry the surface textures and designs. Yet others see the pod as a mere component in the creation of a larger, more complex work. Here are some of my favorite polymer clay pod images from artists all over the world. Tammy Adams of Paisley Lizard made a whole slew of polymer clay seed pods for a design challenge and then turned them into earrings. 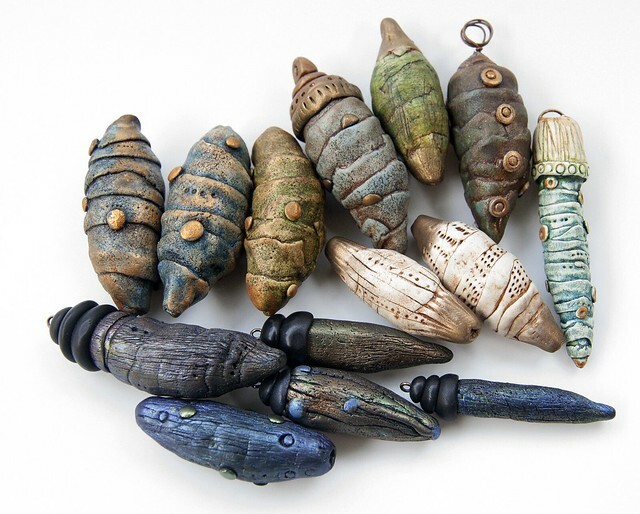 She used her own sculpting and in one case a mold she made from some maple seeds to create these lovely polymer clay pods. So cool. You can see a lot more on her blog post, too. Tammy has listed some of these earrings in her Etsy shop as well. A collection of seed pod earrings by Tammy Adams of Paisley Lizard. See more pictures and a lovely article on her blog. The host of the same challenge that Tammy joined also chose to make seed pods for her entry. In the Earrings Everyday blog, Erin Prais-Hintz showed us a lovely array or organic pod shapes all perfectly executed in polymer clay. Have a look at the shapes of these lovely organic pod headpins. 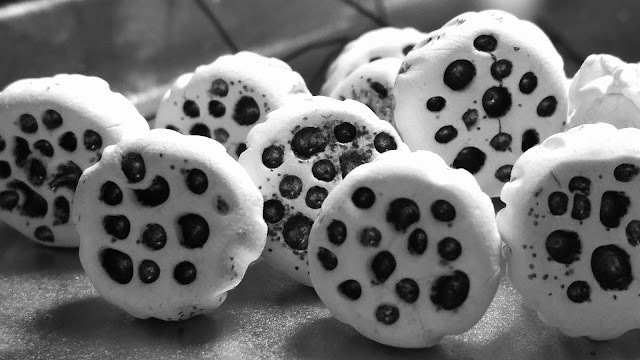 Erin says that she hasn’t created the color on them yet, so the picture is in black and white to showcase the shapes. You can see more of Erin’s work in her shop Tresori Trovati. 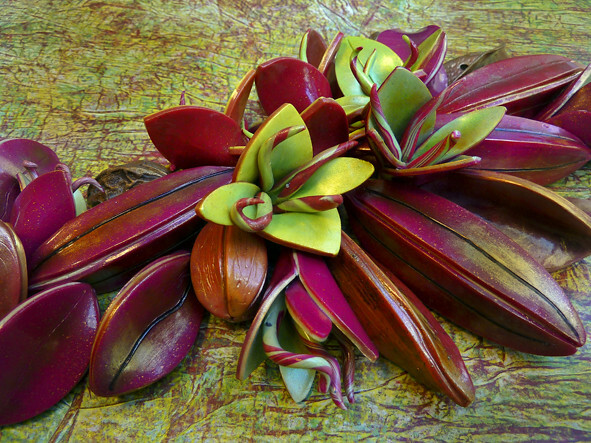 Organic seed pod headpins in polymer clay by Erin Prais-Hintz. See more on the Earrings Everyday blog. 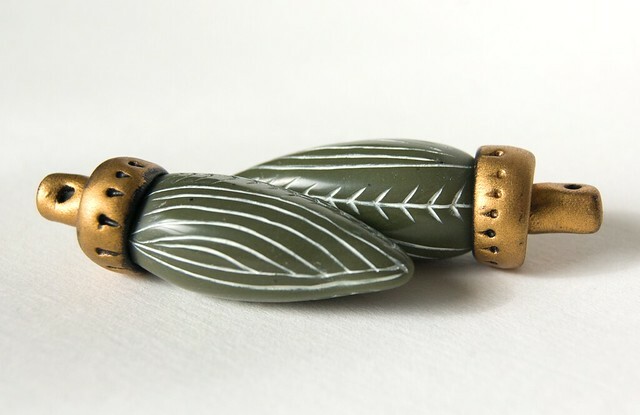 Unlike any seed ever grown in nature, the hollow polymer clay pods that Claire Maunsell creates are a true sensory delight. While Claire does enjoy playing with shape and form, what really stands out in her pod work is the rich, deep, and mysterious textures and colors. She uses many layers of color, building one upon the next until the effect is “just right”. She’s told me that doing surface work on a hollow pod is actually easier because the shape will take texture without flattening the pod shape, unlike what can happen when texturing a solid mass of raw polymer. Here are a few of Claire’s polymer clay pods. Claire doesn’t have tutorials (yet) but you can learn from her in a CraftCast class and she does teach workshops around the world if you’re lucky enough to match schedules with her. You can see more of her incredibly gorgeous work on her Flickr photostream here. 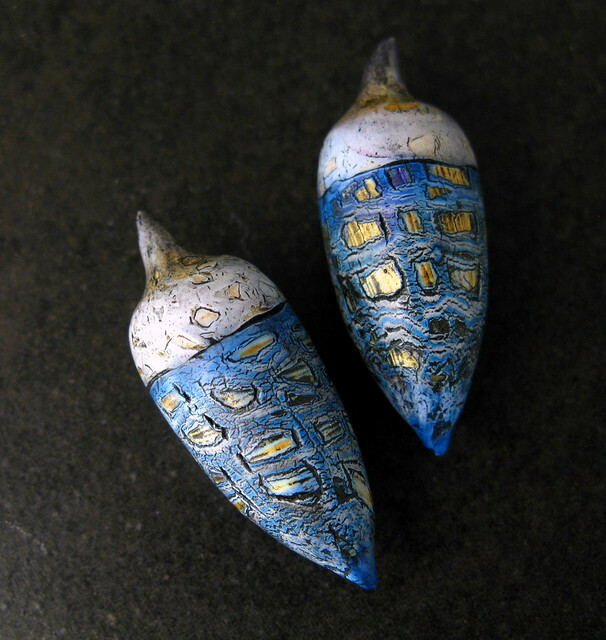 Selena Wells makes polymer clay work with an ancient feel. Like there is a story deep within, from a time long ago. She says of here work, “I make things I wish I could find– things that should already exist but somehow don’t.” Yes, that’s it. Exactly. These polymer clay pods rely on texture, but also shape, with dots, stripes, and caps. Selena’s work can be seen on her Flickr photostream here, and you can find her work on Etsy as well. Luann Udell also makes work that evokes a feeling of being an old artifact. These spindle-shaped beads appear to be made of nature and worn by time. 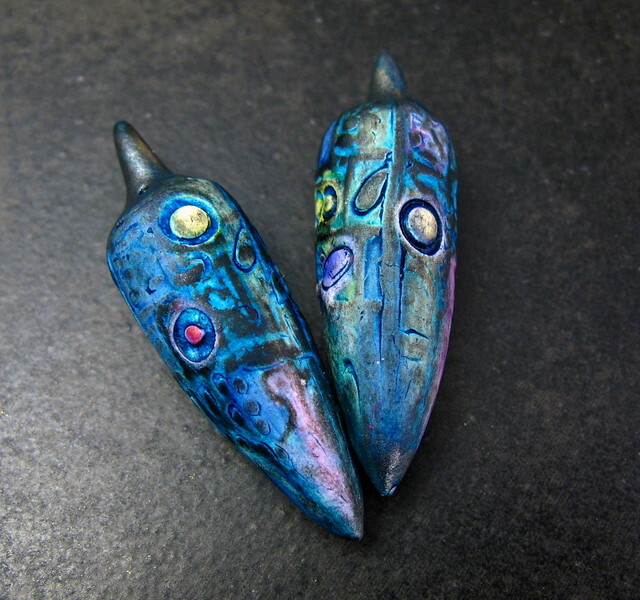 Lori Phillips sculpted and painted these polymer clay pods by hand. Note how the bright colors are different from the worn, aged, and rustic pods we’ve already seen. These tropical pods by Sabine Speisser showcase the interplay of colors and the pods are merely a vehicle for creating a lush floral feel. 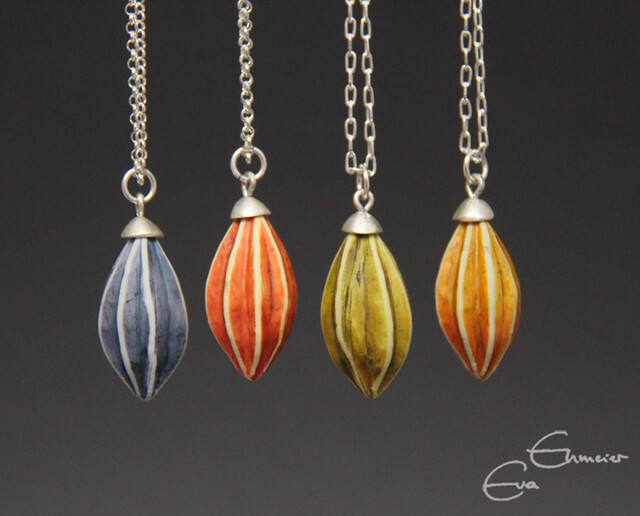 Here we have a series of pods simply hung from a sterling silver chain by Eva Ehmeier. She calls them the “Naucum Pendants”. Even within the constraints of the general pod shape, the trademark style of an artist still shines through. 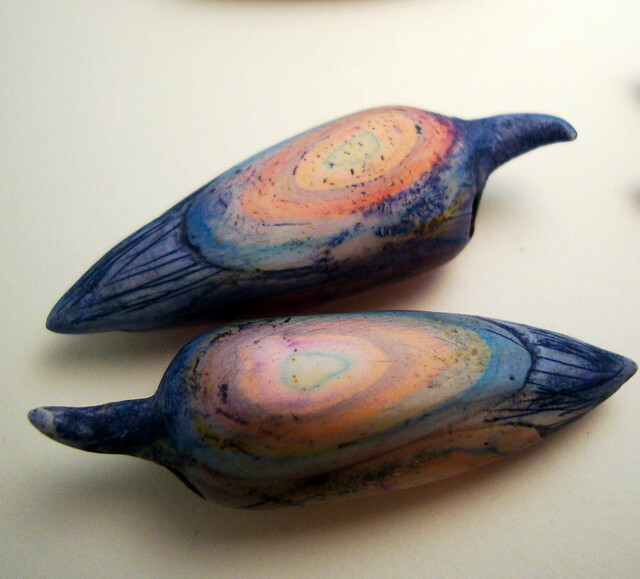 These pods by Margit Bohmer feature her trademark bright rainbow colors dusted with black. Yes, I’ve even created a few pods of my own. It’s such a great shape that works well for so many things. I might just have to make more soon. These Rustic Podpins are featured in my Rustic Beads Tutorial. You could make them in any shape, really, using the basic coloring information that you’ll find in the tutorial. I made these bead pairs using the techniques in my Organic Beads Tutorial. These are both irregularly shaped with visual texture and also colored richly, detailing the texture as well. Want to try making your own pods? Here’s a neat tutorial by Staci Louise Smith over on the Polyform blog. I interviewed Staci recently and you can see her work in that article. She’s another “pod person”! As you can see in this post, there are lots of ways to make polymer clay pods. My two tutorials listed here are just a small sampling of all the ways that you can color and finish the pods that you create. Start looking around and noticing all the ways that artists use the general pod shape to create beautiful creations in polymer clay. What an amazing collection of polymer clay pods. They’re as diverse in form and color as the real thing. 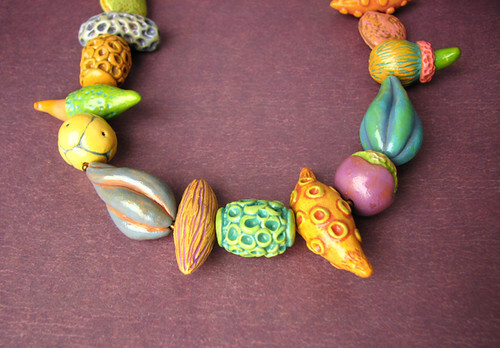 It was your rustic and organic beads tutorials that really jump-started my use of polymer clay in jewelry. And, of course, I blame you for introducing me to pan pastels and assorted other materials, tools, tips, and techniques for this amazingly versatile medium. Thank you, truly, Ginger, for being so generous with your knowledge. Thank you my dear. It was your post that made me get distracted by all the pod-y goodness in the polymer world. Isn’t it really wonderful what people can create? Oh it does sound like you are having a wonderful time. I so look forward to seeing what you make. You work is always so inspiring. I want one of each of all of these! It’s just awesome to see what all these creative minds come up with. Thanks so much for sharing this novel idea Ginger, great article! They’re great, aren’t they? It makes you want to hold them in your hands and play with them. It always blows my mind to see the huge variety that people make with the same basic concept (such as a pod) and the same materials (polymer). I’m glad you enjoyed the eye candy. Oh my– how did I miss this for a week? I’m so flattered to have my pods shown in such illustrious company. Thanks Ginger! I had trouble picking just one. You have so many wonderful ones!